This stripped down 'semi' takes on 57 Classic and Super 57 Classic pickups, and a great 'C' neck profile. The 335 Studio has the F-Hole emblem engraved truss rod cover and redesigned neck dims that add thickness to the Peghead transition and also a Historic Truss Rod that has Teflon coating, larger diameter rod, original brass anchor and a larger washer. Binding is rounded off to comfortably fit the contours of the player's hand. Lower fret height provides smooth playability and accurate intonation. Solid connection from the stop bar to the body of the guitar increases resonance and sustain. In very good condition......weighs 8 lbs. Close to the size of a Les Paul, this affordable model features the same great-sounding BurstBucker pickups and semi-hollowbody design of its siblings minus the binding and block inlays. It comes with simplified controls, traditional C profile playing, redesigned neck dimensions, an improved truss rod system, rolled neck binding, low profile frets, Grover tuners and locking stopbar tailpiece. 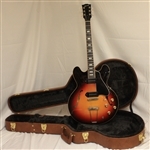 Includes Gibson hardcase and COA. The Gibson ES-330 model is a true old-school classic. With its vintage looks and tones, Gibson have made this iconic instrument part of the impressive 2018 Memphis line-up. This incredible hollow-body guitar boasts full, open sounds that are perfect for jazz, blues and rock. Despite retaining the essence of the longstanding design from decades ago, the 2018 ES-330 features updated hardware and versatile MHS P-90 pickups. We think that with these appointments, this instrument will appeal to modern players too. The new Gibson ES-330 in a Sunset Burst finish is designed with historic hollow-body features at heart. This impressive guitar incorporates modern enhancements like an ABR-1 bridge with titanium saddles, and a hand-wired control assembly paired to our MHS P-90 pickups with hum-cancelling capabilities. The Vintage Style White Oval Button tuners and Thinline Trapeze tailpiece conjure a classic Gibson look. Includes Gibson hardcase and C.O.A. Nobody makes a semi-hollowbody guitar like Gibson. This superb 335 is handcrafted in Gibson's Memphis Custom Shop on Beale Street for quality craftsmanship you can count on, and from a city that knows how blues should sound. Carefully selected maple and poplar tonewoods give the Gibson Memphis 335 its signature bark, and a carefully calipered body cavity with Titebond 50 glue joints and a maple center block give it its controlled howl and haunting sustain. Excellent condition.......weighs approx. 8.3 lbs. Includes Hardshell case and C.O.A.